When the South Korean boy band BTS hit the No.1 spot on the Billboard album chart last June, it was an historic first. About four months later, the group did it again. 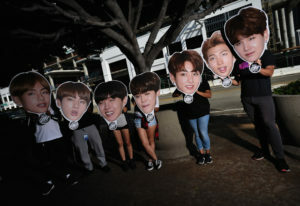 The chart-topping band may have taken the genre’s doubters by surprise, but modern K-pop’s global rise has been decades in the making. Its first progenitors can be traced back to the early 1990s when Seo Taiji & Boys rapped about the societal pressures placed on Korean youth. Today, K-pop songs, sung mostly in Korean, have been translated by fans for an English audience (as have band interviews, tweets and videos). The songs, too, sometimes address social issues that are both Korea-specific and universally relatable. K-pop is infrastructure, a mix of sound and vision and social media, a friend who is a devoted K-pop fan once explained to me. Red Velvet is a five-member girl group, and this song is a slinky R&B dance song. The act has two sides to them: They have the “red,” poppish, funky side, and then the “velvet” R&B side. So “Bad Boy” kind of leans into the second half. There’s a dynamic performance element to the music video, and the song is addicting and gorgeously pretty. Loona is a girl group that has an intensely vibrant internet following. The music video for this song features a diverse assortment of women in an empowering situation rising to the occasion, sort of like a butterfly. It is an inspirational song about coming into your own as a woman. The performance element, again, is gorgeous. The song is a really sleek synth pop song. It’s really well done. “Singularity” is a well-produced neo-soul song. I think a lot of times when people are trying to listen to K-pop, if they’re not a pop music fan or they’re not into EDM, something like “Singularity” really will resonate. It’s a song you want to listen to when you’re alone and you want to feel something. V [a member of BTS] has a gorgeous tone. He has a really distinct way of approaching the music, and the performance style is visually captivating. It’s a ballad, but there’s some choreography involved, and V does this very fascinating mannequin dance with himself. This is not even just my all-time favorite song — I think it’s one of the best songs of the 21st century. It is perhaps one of the finest productions I’ve ever heard in my entire life. I don’t know how to describe it. It’s just something I love so much. The song is an orchestral approach to synch pop, and INFINITE put on a really good performance of what it means to be producing a boy band sound that is built on a dance element. The biggest thing about K-pop is that every single song is pretty much made to be performed, whether it’s a single or a B-side. As you’re listening to “The Chaser,” you can hear the way that they’re going to dance to it. This song is by Hwasa of [girl group] Mamamoo. Mamamoo is a vocal pop quartet and they have a very dynamic performance style to them. They do these sweeping pop songs full of dramatic, expressive vocals and they have a fun, retro style. This song that showcases Hwasa’s individual talents. It’s one of the biggest hits of 2019 [in Korea]. It’s a song where Hwasa is essentially telling her boyfriend that he’s a “twit” for loving someone like her who is not necessarily into him. In the song, Hwasa references South Korean traditional folk tales. The music video shows her doing all these different performances. More and more, [K-pop artists] are becoming the guiding factor of their own distinct sound. It’s the sort of thing that feels authentic to who Hwasa is as a public person. Editor’s note: This story originally said BTS topped the Billboard album chart twice last year, six months apart. It was closer to four.